if I copy & paste text from a website to a document, then copy & paste part of that text from the document to an email I get additional information that was not in the original text. I've copied the following text from the TenFourFox home page to a doc. 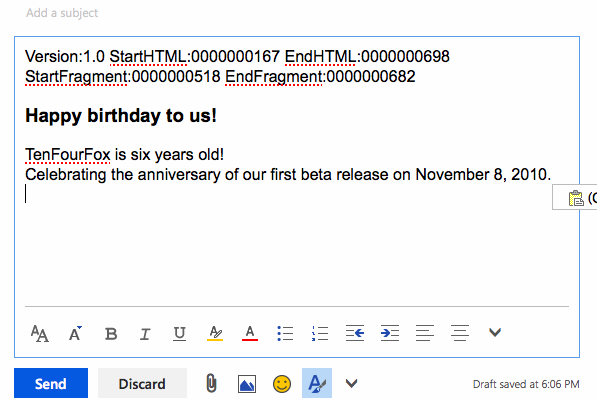 TenFourFox is six years old! Celebrating the anniversary of our first beta release on November 8, 2010." When I copy & paste the above text from the document to an email it shows up as below. This does not happen if I copy & paste directly from the web page. It only happens when I've copied & pasted to a doc and then copied & pasted the text from the doc to the email. Is there an option to disable this additional information being pasted.